Looking back at my days working in an office, I realize how much random stuff I used to browse on the internet. One of the things that I remember used to keep me particularly entertained were websites listing unusual hotels around the world. In was in one of those articles that I first came across The Mirror Cube. 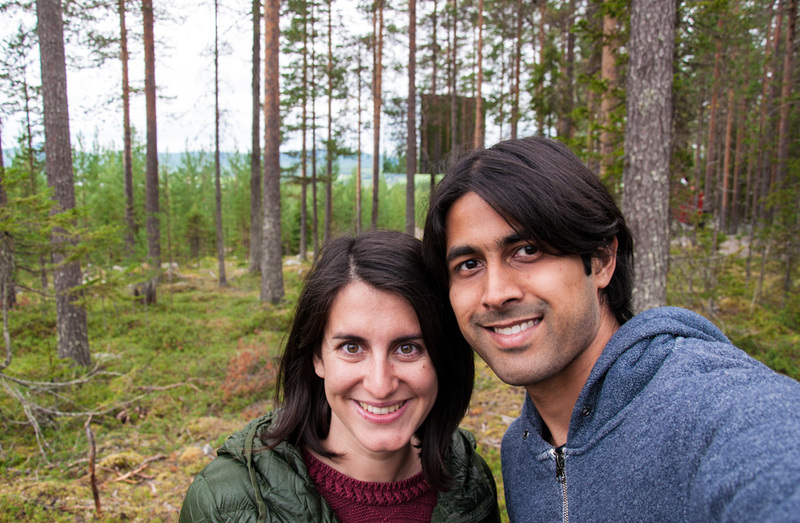 When we spent a month living in Stockholm this summer, we felt the need to visit another region of Sweden. After all, we came to explore the country, not the city. 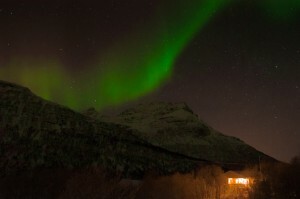 And this is how we ended up booking a flight to Luleå, up north in Swedish Lapland. 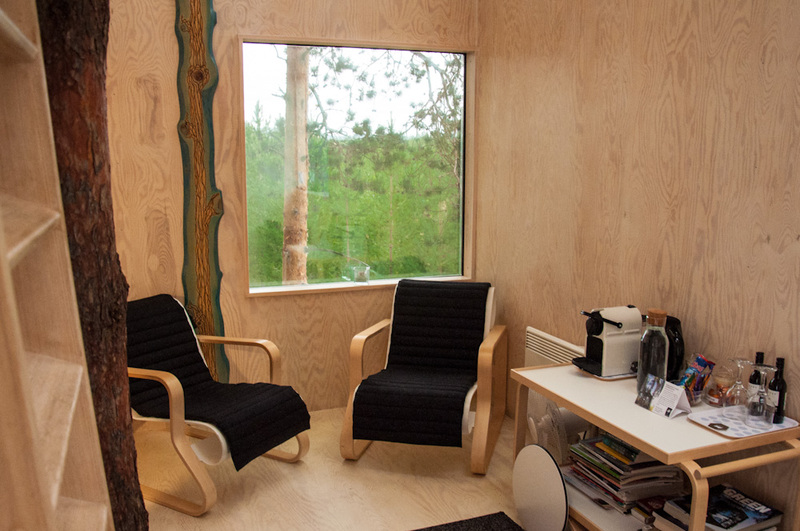 Accommodation was a no brainer: we had to stay at The Mirror Cube in Treehotel Sweden! 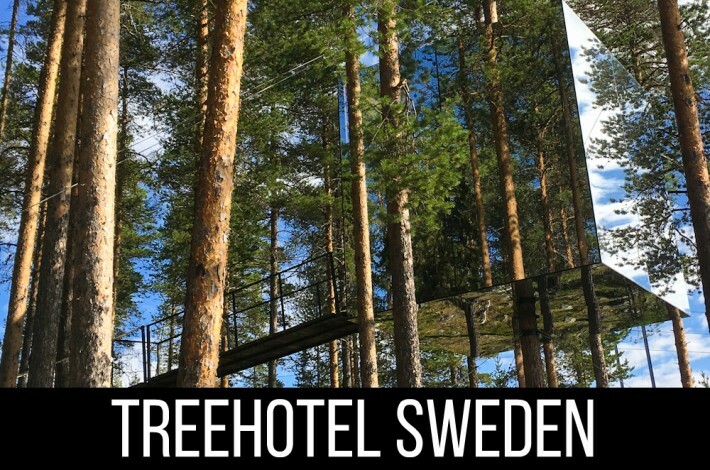 Treehotel Sweden is no ordinary hotel! Lodging consists of six different tree houses, erected in the forest surrounding the village of Harads. 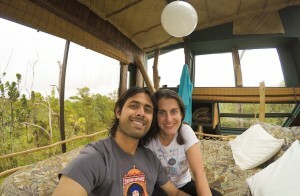 Each tree house has unique architecture, interior design and features. They all include at least one double bed, but there are options for up to 6 people. 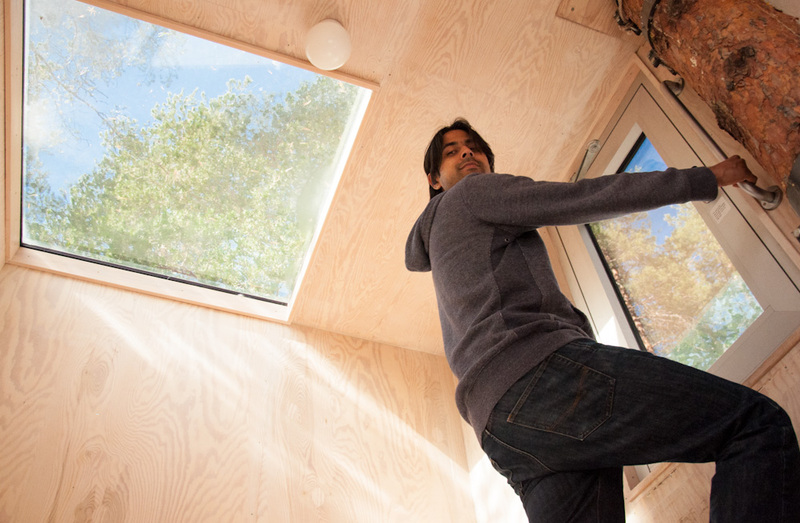 Apart from sleeping and seating areas, each tree house has a small washroom, with toilet and sink. 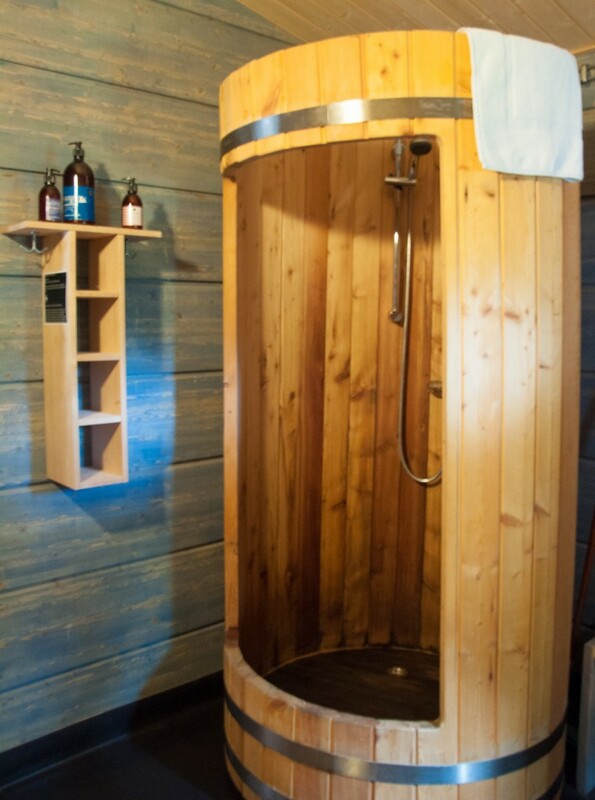 To shower, guests need to visit the common areas where showers and saunas are located. No matter what tree house you end up staying at, you are never more than one minute walking from these facilities. In the shower area, you will be able to freshen up using a beautifully scented range of organic products made locally. 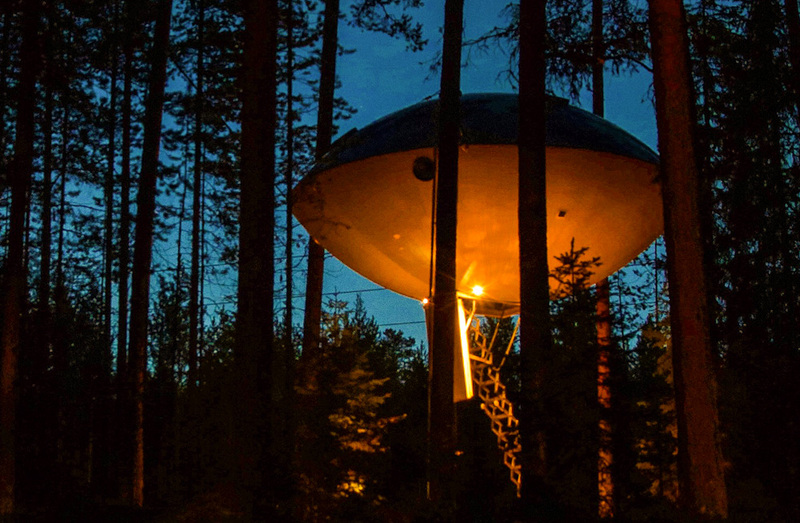 The aesthetic scene of Treehotel Sweden ranges from rustic to futuristic. The Cabin is the first tree house you come across after walking the path that takes you from the parking lot and through the forest, to the green area where the tree houses are clustered. A few steps ahead, the rusted colors of The Dragonfly appear and they combine beautifully with the earthy tones of the surrounding nature. 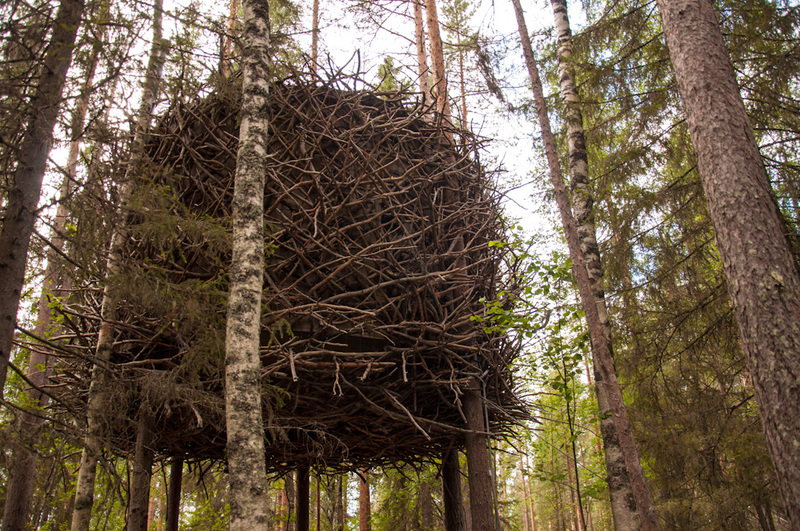 Nearby you can admire The Bird’s Nest, which you can almost miss if you didn’t know it was there – no other tree house in Treehotel Sweden is as disguised among the natural surroundings as this one! The UFO strikes you as something like out of the movie E.T. and manages to look even more magical when the night comes down and the yellowish light shines an aura of mystery onto it. The oddly named The Blue Cone is actually red and the beauty of it, apart from the obvious charm of the tree house, is that it is wheelchair accessible. While to enter most of the tree houses you will have to walk up a hanging wooden path or retractable stairs, a large ramp will lead you into The Blue Cone. Finally, comes the star of the show: The Mirror Cube! 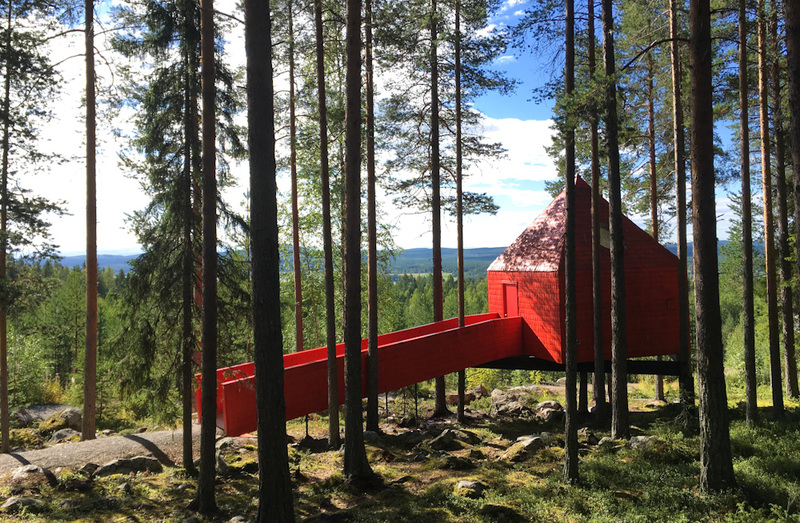 While admiring all the different tree houses of Treehotel Sweden was an experience per se (and you can actually book a quick tour to visit even if you do not book yourself in for the night), the highlight for us was to spend the night at this reflective tree house. You can book several nature and adventure related activities while you stay at Treehotel but, trust me, chances are you will not want to leave the tree house area itself! We walked towards it for the first time while doing a live video stream on Facebook. Even though I was aware of how much The Mirror Cube blends in with its surroundings, it still struck me as incredible how camouflaged our room was! The construction is made entirely with mirrors which reflect the trees that are around it. At times, depending on the light, you can’t almost tell where the actual forest ends and where The Mirror Cube begins. While we were a little concerned if this would be problematic for birds, we were happy to learn that the walls include an infrared film. Even though the film is invisible to us humans, it is perfectly noticeable for birds, preventing collisions. After walking up a hanging wooden path that looked like a less intimidating version of the one in Indiana Jones and The Temple of Doom, we were finally inside The Mirror Cube! This may be a tree house, but that doesn’t mean comfort and even some high end touches weren’t included. The bed is a perfect mix between firm mattress and fluffy comforter. There is a small seating area indoors, bathed with beautiful amounts of natural light. This is quite an idyllic setting to enjoy reading a book, connect yourself to the local WIFI, or chill out while using the mini-bar. There is drinking water, tea, hot chocolate, wine and even a Nespresso machine. If the day allows, you can walk up to the rooftop of The Mirror Cube, where you can sit at the balcony surrounded by mirrors and tall trees. In the distance, you’ll see the vastness of the Lule River Valley. 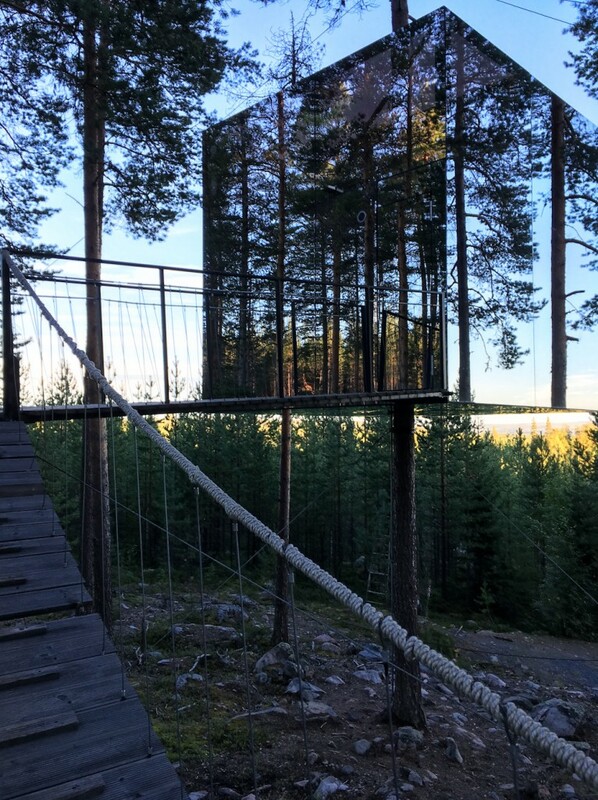 The rooftop balcony of The Mirror Cube: with views of the surrounding forest, the Lule River in the distance and yourself right there, in the mirrors! 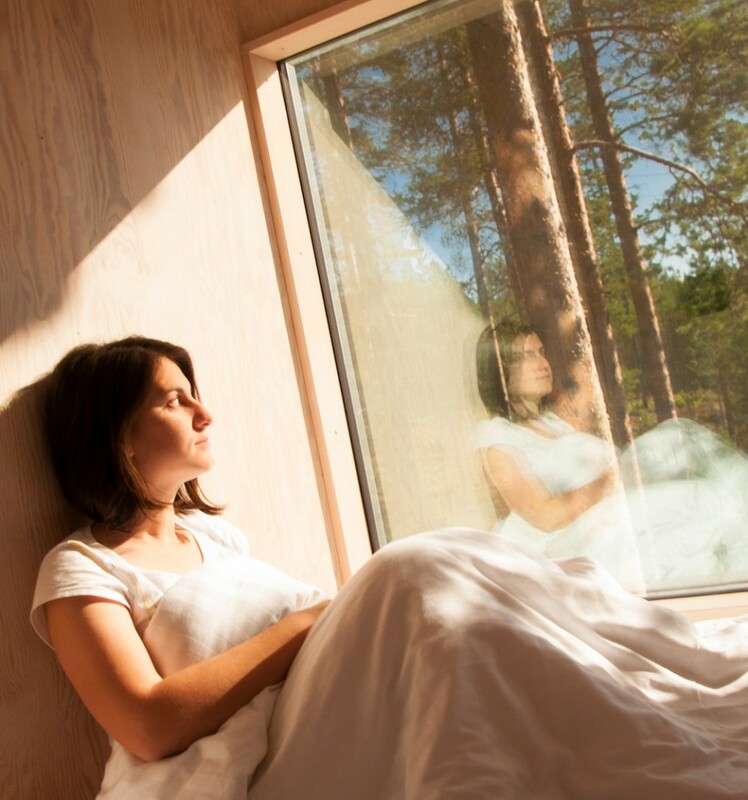 Apart from being visually stunning and actually comfortable, every tree house in Treehotel Sweden was designed in an eco-friendly way. The toilets are either burn toilets where the waste goes underground and is incinerated, or freeze toilets where the waste is accumulated and later disposed. Over all, you can feel that there has been a lot of thought and excitement put into creating this wonderful place. You can feel this in all the little details. 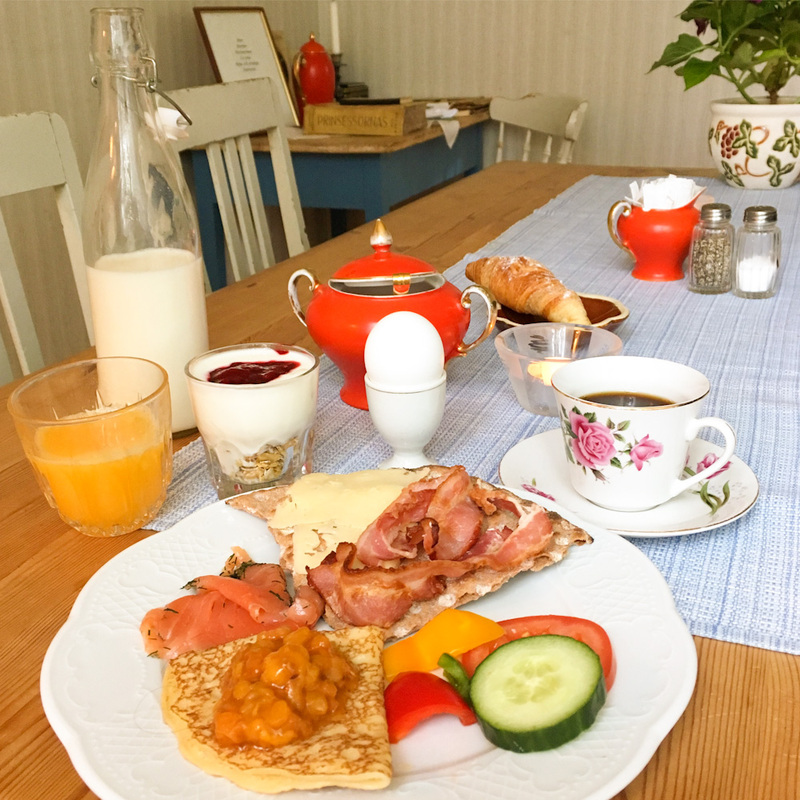 Breakfast at Brittas Pensionat was such a great complement to the Treehotel experience! 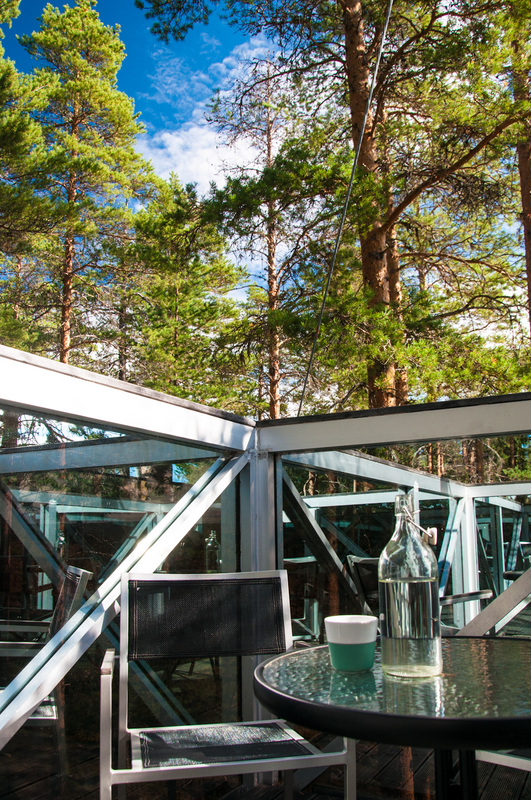 Both Treehotel Sweden and Brittas Pensionat belong to the same family. The guesthouse is the first thing you will visit when you come to the Treehotel. After a night at the Treehotel, we enjoyed another couple of days at one of the suites in Brittas Pensionat. They have several rooms and small apartments which kitsch interiors and a charming small town vibe. When you come to stay at the Treehotel, you’ll share a parking lot with Brittas and this is where the reception is located. This is also where you’ll have your meals, after walking for five minutes from the forest where the tree houses are located. Britta’s breakfast is served buffet style, featuring a delicious spread of wholesome options. 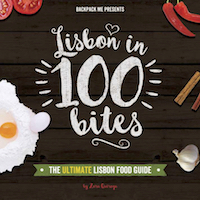 Apart from cold items such as yogurt, granola, fruits and orange juice which you can squeeze yourself on the spot, several cooked goodies such as eggs, bacon and pancakes are also on display. 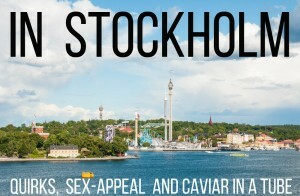 Swedish favorites like cold cuts, cheeses, salmon and caviar in a tube are also available. Hot coffee, milk and cookies are not only a part of breakfast, but also up for grabs in the dining room all day, complimentary. The homemade jams made with berries from the region were simply outstanding. Breakfast at Brittas Pensionat was more than a meal, it was pure joy! You can tell a lot of the things that happen around here, both at Brittas and Treehotel, have that special secret ingredient called love. During certain months of the year, lunch is served at Brittas. 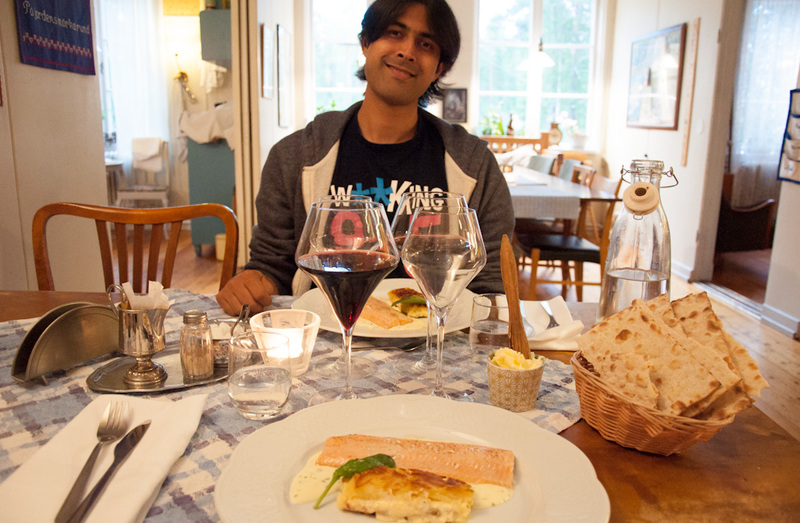 In the evenings, a 3 course set dinner is a given! 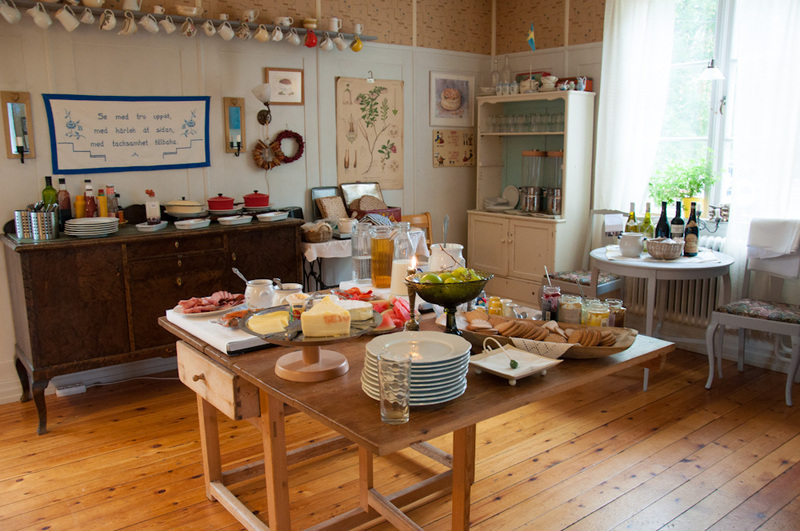 On the menu, you’ll find traditional Swedish dishes from this region, made using mostly local and organic ingredients. Expect recipes involving fish such as Arctic char and meats like moose and reindeer. 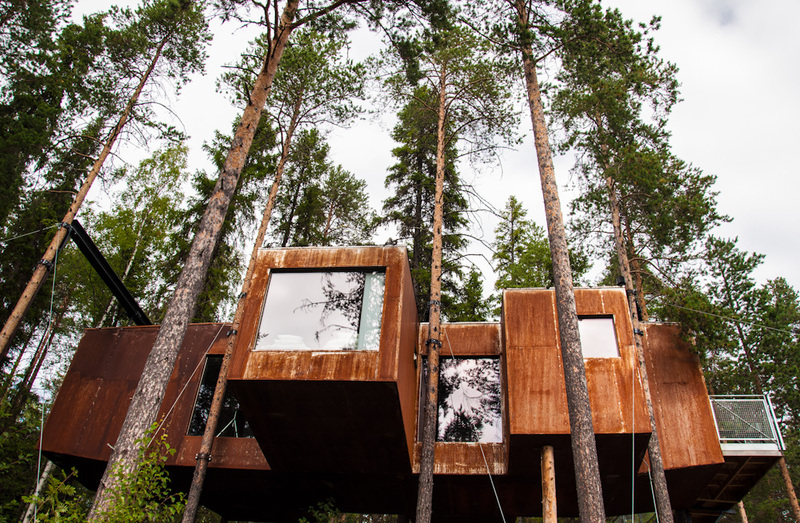 Treehotel Sweden is one of the dreamiest places we have been lucky to stay at! And I shall keep on dreaming that, one day, I’ll be fortunate enough to go back. 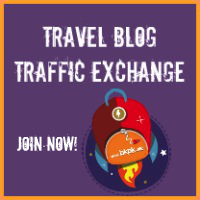 Perhaps next time we’ll visit during Winter and get to see from up close why Treehotel is so popular when everything is covered in white fluffy snow, as picture perfect postcards from Lapland tend to be. Now seriously, The Mirror Cube is out of this world.. I hope you do get to visit sometime! Seeing a work like this is wonderful to look at. The construction of this place is unique and almost everything is made from wood. This is a must see place. This is indeed the best place to unwind and rest with your loved ones. It’s a good choice for those who are having a stressful life.